San Francisco based software company InLoox, Inc. engineers project management solutions that facilitate Outlook integrated project planning and execution. The full-featured project soltuion includes a clever time tracking system. More than 45,000 users in over 3,500 companies around the globe already successfully drive their projects to success with InLoox project and time tracking solutions. With InLoox PM you can make the most of your project based business processes: The tool helps you optimize the coordination of multiple processes and allows you to analyze and evaluate your buiness efforts at at glance. Existing Outlook calender and task list entries can easily be used as the basis for a complex project plan. Use custom cost centers to record completed tasks and assign them to relecant projects. Customizable fields can be defined for each individual project, giving you exactly the flexibility you need for optimal project management. InLoox PM includes a time tracking feature that allows you to record work hours at the click of a button. 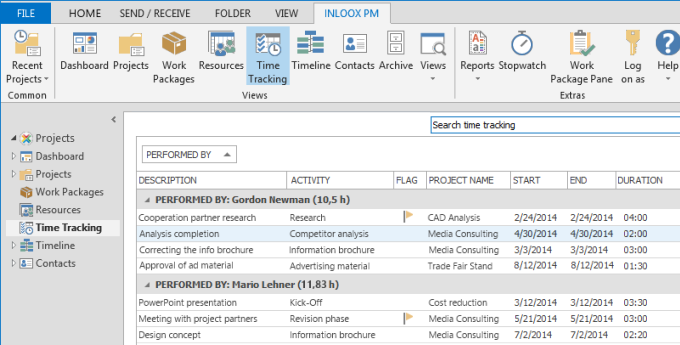 The time tracking button is integrated in your Outlook user interface, making it extremely easy to continuously record time expenditures for every project you currently work on. You can even assign work hours to relevant projects via related Outlook calendar entries. Moreover, the InLoox PM journal allows you to record work hours that have been spent on editing existing Microsoft Office applications like Microsoft Word and Excel and automatically assign them to the related project. Enjoy the same comfortable feature for project related phone calls and AutoCAD. Especially when you are constantly on the go, working from your customer's site or spending much time on business travel, InLoox PM provides a work system that adjust to your specific needs. Combine your Outlook integrated InLoox client with InLoox PM Web App and access all your most up-to-date project information via your favorite internet browser - anywhere, anytime. InLoox PM - a time tracking system that is just as mobile as you. Simple Time Tracking with InLoox Project Software • Copyright 1999-2019 © InLoox, Inc. All rights reserved.